As much as I love a great hero, it's the heroines who matters most to me. Whether I'm reading a romance or high fantasy I want an intelligent, strong woman or girl in whom I can find an avatar after a fashion. From Selene in the Underworld films to Storm of the X-Men comics I have always gravitated toward powerful females who can both keep up with their male peers and still hold on to their emotional, oft times inherently feminine natures. They don't have to be perfect, in fact I prefer them deeply flawed and enjoy the journey with them as they get stronger or heal from their pasts or learn to control new powers. For my giveaway I decided to give away the first Arcadia Bell book because it's such a terrific series and unlike some of these it's not a finished series yet. Please enter via the Rafflecopter. Winner must be able to accept a gifted Kindle book through Amazon.com. 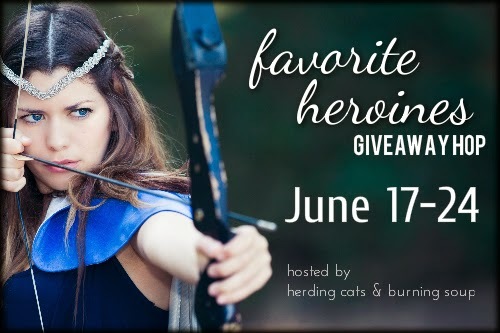 Now hop along to these other great blogs to find out who their favorite heroines are and more chances to win great books! I would love to spend the day with Eve Dallas and see what her house looks like. I'm partial towards Tienne in One Percenter, obviously, but now I have a huge list of awesome reads to check out! Thanks! Charley Davidson from the Charley Davidson series by Darynda Jones. Reyes Darrow, need I say more?! I would love to be Eve Dallas for a day so I can have Roark all to myself, and have all of her great friends! Also be a cop for the day! Hermione Granger! Because smarts and magic make a wonderful combo! Would love to spend a day with Toby Daye from Seanan McGuire's series to see all the magic from the Fae in San Francisco! I'd love to be Storm from the X-Men. I'd love to have her powers and hang out with the other X-Men, too. Daenerys Targaryen from Game of Thrones because she's someone who started off at the bottom and has slowly built her way up. Plus, she's the mother of dragons. What more could you ask for? I'd have to say Kate Daniels. She's my current fave and though she gets in a bunch of trouble, her stories are always interesting. Favorite is Lieutenant Sam Holland from Marie Force's Fatal Series - her ability to compartmentalize is amazing...plus she was very lucky in the hero department. Claire from Outlander! Thanks for the chance.